Only got a minute of free time? That's all you need to complete a New York Times mini crossword puzzle! Conveniently pint-sized and easy to solve, these charming minis are too cute for any puzzler to resist. JOEL FAGLIANO is the digital puzzles editor at The New York Times. He also works as the assistant to Will Shortz on the print puzzles. He's a 2014 graduate of Pomona College, with a major in Linguistics and Cognitive Science. Joel lives in New York City. 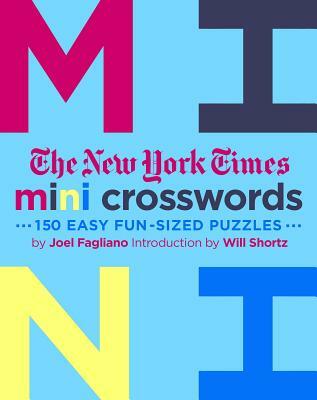 Will Shortz has been the crossword puzzle editor of The New York Times since 1993. He is also the puzzlemaster on NPR’s Weekend Edition Sunday and is founder and director of the annual American Crossword Puzzle Tournament. He has edited countless books of crossword puzzles, Sudoku, KenKen, and all manner of brain-busters. The New York Times is a daily newspaper published in New York City and distributed internationally. Founded in 1851, the newspaper has won 112 Pulitzer Prizes, more than any other news organization. Its website receives 30 million unique visitors per month.